A versatile granulated sugar from Traidcraft which is perfect for all kinds of home baking, from shortbread to puddings, cookies to cakes. Suitable for vegetarian diets. Certified Fairtrade. Store in a cool, dry place. Once opened store in an airtight container to prevent hardening. 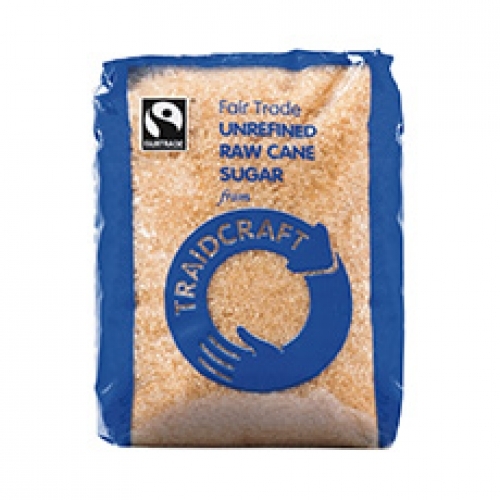 The Traidcraft Fairtrade Raw Cane Sugar - 500g product ethics are indicated below. To learn more about these product ethics and to see related products, follow the links below. Love this sugar....lots of flavour similar to the smell and taste of good Demerara. There are currently no questions to display about Traidcraft Fairtrade Raw Cane Sugar - 500g. Traidcraft is both a development charity and a trading company, producing ethical gifts, fair trade clothing, organic groceries and more. Traidcraft has formed and developed lasting relationships with small scale producers in developing countries from all over the world, and continually campaigns for trade justice. Traidcraft are the UK's leading fair trade organisation, fighting poverty through trade since 1979. Traidcraft products directly help and support producers in the developing world and range from delicious breakfast cereals, Geobars and cookies, to handmade paper cards and embroidered goods.